"Our motivation for doing this is because the chemicals often come up as mixtures," Borch said. "While you may see biodegradation of a surfactant under normal circumstances, if you spill that together with a biocide that kills bacteria, maybe you don't break that surfactant down as quickly. And that's exactly what we see. If chemicals don't degrade as quickly, it gives them more time to be transported to groundwater or sensitive surface water." "We cannot say our findings are valid for all the different chemicals used worldwide in hydraulic fracturing," Blotevogel said. "There are probably 1,000 different chemicals used globally, and they all behave very differently with respect to how they are broken down." 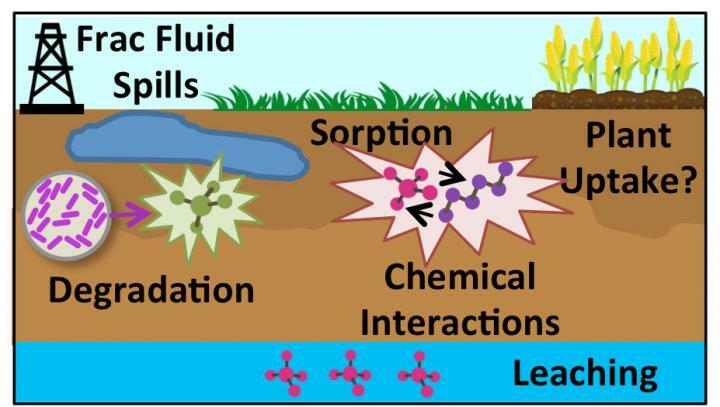 Borch and Blotevogel previously published a comprehensive review of the biocide toxicity in hydraulic fracturing fluids and have worked together for almost nine years. The ES&T study was supported primarily by CSU's School of Global and Environmental Sustainability (SoGES), a grant from the CSU Water Center, and by the Borch-Hoppess Fund for Environmental Contaminant Research.